Laundry coupon found on Brandsaver.ca. This coupon is valid only in Canada and can be found on Brandsaver.ca’s coupon page this month. You can print this coupon directly from your computer. 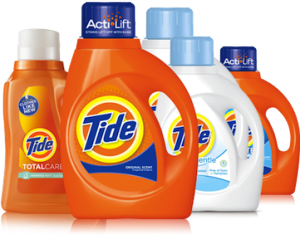 This coupon is to save $0.50 off Tide laundry detergent, fleece or Bounce product. Excludes any trial/travel size, value/bonue/gift packs. You can use this coupon in any grocery store, supermarket across Canada. I’ve used Brandsaver coupons in Loblaws, Shoppers Drugmart, No Frills with no problems. “Zap! Cap,” a unique pretreat cap with scrubbing bristles to provide a deep-down, pre-treat option. The cap features two textures; bristles for deep down scrubbing and a flatter portion to spread the detergent around. Put Zap! Cap to work for you with Tide Ultra Stain Release – even the cap fights stains. If you have an HE washer, look for your Tide with the HE logo on the bottle. ” From Tide website about the New Ultra Stain Release Liquid Detergent.